Discover comfort in our spacious accommodations featuring a queen size bed and sofa bed. The full bathroom includes a ¾ bath, walk-in shower, complimentary amenities and hair dryer. Relax in the comfort of our well furnished living spaces which feature recliners in the one- and two-bedroom accommodations. Enjoy the convenience of either your full or partial kitchen equipped with a refrigerator, microwave, stove, coffee maker and dishwasher among other modern appliances. Additional in-room amenities include cable television, DVD player, balcony/terrace, iron/ironing board, telephone and air conditioning. Start out going east on E Sky Harbor Blvd toward Terminal 3. Then in 0.13 miles take E Sky Harbor Blvd toward Terminal 2/Terminal 3 South Side/Rental Car Center. Then in 0.09 miles turn slight right onto Terminal 4. Then in 0.01 miles turn slight right onto E Sky Harbor Blvd. Then in 0.40 miles take E Sky Harbor Blvd toward Terminal 2/West Economy/Cell Phone Lot/Rental Car Center. Then in 0.45 miles keep right at the fork to continue on E Sky Harbor Blvd. Then in 0.03 miles keep left at the fork to continue on E Sky Harbor Blvd. Then in 0.49 miles keep right at the fork to continue on E Sky Harbor Blvd. Then in 0.91 miles turn slight right onto I-10 W/Pearl Harbor Memorial Highway/Papago Fwy W. Then in 0.52 miles take the AZ-51 N exit (EXIT 147A-B) toward AZ-202 Loop E. Then in 0.71 miles merge onto AZ-51 N via EXIT 147B on the left. Then in 15.17 miles merge onto AZ-101 Loop E/Pima Fwy E/Loop 101 E via EXIT 15A. Then in 4.50 miles take the Scottsdale Rd exit, EXIT 34. Then in 0.40 miles turn right onto N Scottsdale Rd. (If you reach AZ-101 Loop E you've gone about 0.3 miles too far). Then in 0.76 miles turn left onto E Princess Blvd. Pass through 1 roundabout. Then in 0.89 miles 7887 E PRINCESS BLVD is on the right. Start out going east on E Sky Harbor Blvd toward Terminal 3 then in 0.13 miles keep left at the fork to continue on E Sky Harbor Blvd. Then in 1.93 miles merge onto AZ-202 Loop E/Red Mountain Fwy E. Then in 4.28 miles merge onto AZ-101 Loop N/Loop 101 N/Pima Fwy N via EXIT 9. Then in 13.81 miles take the exit toward Frank Lloyd Wright Blvd/Bell Rd/38. Then in 0.35 miles merge onto N Pima Rd. Then in 0.50 miles turn left onto N Frank Lloyd Wright Blvd. (If you reach Westworld Rd you've gone about 0.2 miles too far). Then in 2.14 miles turn right onto N Scottsdale Rd.(1. N Scottsdale Rd is 0.5 miles past N 76th St. 2. If you are on E Bell Rd and reach N 68th Way you've gone about 0.3 miles too far). Then in 0.58 miles turn right onto E Princess Blvd. Pass through 1 roundabout. In 0.87 miles 7887 E PRINCESS BLVD is on the right. Rich in color and resplendent in the Native American history of the Hopi, Navajo and Pueblo culture, the Southwest presents intriguing red rock formations, 225 million-year-old fossils and the multi-hued badlands of the Painted Desert. The ancient Petrified Forest, stretching from New Mexico to Arizona, is just steps from one of the Seven Natural Wonders of the World—the Grand Canyon. Encompassing the Colorado River and the adjacent uplands, the Grand Canyon provides visitors with breathtaking scenic landscapes. 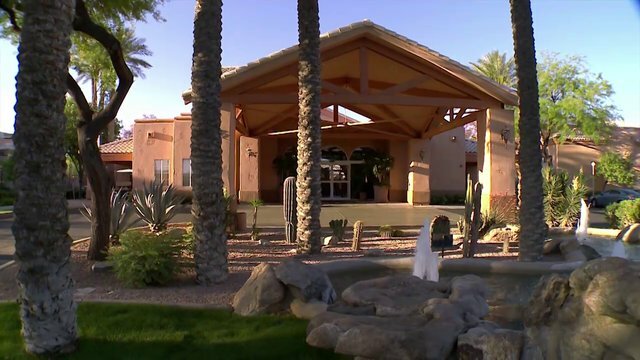 We will be completing sidewalk construction to upgrade our ADA path of travel at Scottsdale Villa Mirage. We will be under construction from January 7 – May 1, 2019. During this time, there will be intermittent noise from 9:00am to 5:00pm Monday through Saturday. We apologize for any inconvenience this may cause as we complete this necessary enhancement to our resort. AQUA Poolside Eatery is open daily from 11 am to 7 pm. - Hotel Guests and Exchange Reservation: A photo identification, credit card for $100 security deposit and a daily $23.95 plus tax resort fee will be required (cash is not an acceptable form of deposit). - Resort Fee includes Wi-Fi, recreational facilities (pools, children's Splash Pad, 24 hour Fitness Center, tennis courts, putting green, horseshoes), garden gas grills, fire pit, children's playground, seasonal activities, 24 hour complimentary lobby coffee/tea, 24 hour business center computer/internet and boarding pass printing. - A resort fee of $23.95 plus tax per night will be added to the reservation if the owner or member of THE Club® is checking in on a rental reservation.